ARTICLE 7 of the Constitution embodies the wishes and will of the nation which fought a bloody Liberation War in 1971. All powers in the Republic belong to the people, and their exercise on behalf of the people shall be effected only under, and by the authority of the Constitution. The Constitution is the solemn expression of the will of the people, the supreme law of the Republic. (Article 7). This Article is a statute of liberty, supremacy of law and rule of law. Anwar Hossain Chowdhury & ors. vs. Bangladesh 41 DLR (AD) 165, 220. Parliament is the creation of this Constitution and all powers follow from this article. (ibid at page 220). This Article is a happy conjunction of the will of the people and the supremacy of the Constitution. The Bengali nation suffered not only under the British but also in Pakistan time under different Martial Law periods. In fact there was never any democracy here in Pakistan time. The Constitution of 1956 could not be implemented and before any election took place Ayub Khan's Martial Law came into effect. When that Martial Law was overthrown, Yahya Khan succeeded as the new dictator. When the results of the December 1970 elections were announced, the dictators and their autocratic friends conspired to thwart democracy by not recognising and giving power to the elected representatives. It is this denial of democratic recognition that finally led to the struggle for a separate homeland for the Bengalis. What the Bengalis fought for was therefore democracy, rule of law and people's rights. The Constitution is a pious embodiment of these wishes. The fundamental rights are mentioned and are enforceable in the writ jurisdiction of the Supreme Court which also checks any action by the executive which has been done illegally or without lawful authority. The Constitution has undergone certain changes and currently we may be seeing another. However the basic spirit of freedom, rule of law etc are still there. 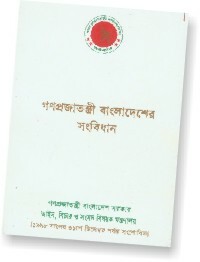 The Supreme Court has defended the structural pillar of the constitution in Anwar Hossain's case (above) holding that the basic tenets of the judicial system cannot be changed. While we were always having interruptions in the working of a democratic government there is one silver lining in the cloud. Neither Ayub Khan's regime nor Ershad's Martial Law Government defied any order of the Superior Courts. Thus, we saw the Supreme Court of Pakistan affirm the Dacca High Court's judgment in Fazlul Quader Chowdhury vs. Mohd. Abdul Hoque PLD (1964) S.C. 486 which declared the parliamentary seat of a prominent minister to have been vacated. The autocratic regime complied with the decision. Similarly the Pakistan Supreme Court and the then East Pakistan High Court constantly protected the freedom of movement and liberty against arbitrary arrests under the umbrella of the Defence of Pakistan Rules by holding that the "Satisfaction" of the detaining authority will be objective and not subjective. The Courts called for the particular records of the case and if the judges found that the arrest was not on objective ground, the detention was set aside. This principle has constantly been followed in cases of detention under the Special Powers Act in Bangladesh. General Ershad's government bowed down to the decision of the Appellate Division when the Court held that the High Court Division can not be bifurcated into seven permanent benches. (Anwar Hossain Chowdhury's case. ibid). It is with deep anguish we note today that the democratic values are being eroded. Judiciary is yet to be separated. Murders go on unabated and crimes are alarmingly on the increase. Immediately all of us blame the law enforcing agencies for failure to check crimes but have we pondered to think that the members of the law enforcing agencies as well as the criminals are nothing but part and parcel of our society. Why is it that we need special draconian laws like the Nari Nirjatan Ain, Druto Bichar Ain which strike terror into the hearts of any prisoner because of the psyche that an accused "should" be guilty if he/she is arrested or tried under those laws. Other countries do not have parallel laws and yet do they not fare better when law and order is concerned ? Laws do not protect the rights of the people in the end but the heart and head do. As long as we do not think of breaking the law and conform to the rule of law which means that everybody should be treated equally before law, democratic values will prevail. For, democracy means rule of the people but that "rule" is according to the law of the land which flows from the Constitution of which the fountain head is Article 7. Why is it that Bangladesh is the only country which needs a caretaker government headed by non elected persons to see the country through an election. Erosion of democratic values which we learnt in our Civics books written and based on English principles in the early years after the British left has been so naked that every political party has accepted that none of them can be trusted to conduct an election fairly. The Nation prefers that election be conducted by a retired Chief Justice who having retired at 65 is deemed to be physically unfit to remain a judge but is found for that very reason to be fit enough to run a country in the crucial period ! Further, after any election, there is always a protest by the losing side that the election was rigged. No one has the democratic sense to accept the results. This intolerance continues and the Ruling Party, whoever it is, becomes busy in arresting the members of the Opposition and the Opposition clamours for mid term election without waiting for the five year period to finish. Democracy means rule of the people for the people and by the people but above all toleration and a patience to wait until the next election. Similarly the losing party with scant feeling towards working the democracy does not attend the Parliament except when it is necessary to keep their seats. They forget that they are elected and democracy cannot function when there is no opposition in the Parliament. They take their emoluments and duty free cars but do not fulfill the promise made to the electorate that they will represent them in the Parliament. Even if the Party in Power does not give them enough scope to ventilate their views, they should attend the Parliament. Democratic values are lost in the pathetic war of words. Our heart saddens further when we see the same pattern reflected whoever is in power or opposition. They call hartals which chokes the nation's economy and then proclaim that it is successful and thank the people for it. Their only weapon is fear of the car and shop owners of unlawful harm. Hartals emanate from "Satyagrahas" and "Foreign Goods Boycott" of Mahatma Gandhi in the early 1920's who however promptly called them off when these were enforced by violence. A lesson to be learnt here. This must mean that as a nation we lack the sense of toleration that is needed for a functioning democracy and we are unfit to govern ourselves democratically. Democracy in the third world countries may be different from those found in developed countries but why is it that we are so unique in ignoring the democratic values ? What jolt do we need to correct ourselves ? Within three years of the Constitution we had a one party government and a string of Martial Laws which ended when people of all hues and colours woke up and took to the streets. But then immediately the rot started and we are lamenting increasingly about the deteriorating law and order and the brazen brushing aside of the spirit that the framers of the Constitution fondly inserted in Article 7 namely that the will of the People is supreme. We equate the will of the "People" with the desire for "Power" and its abuse and we do not treat our election commitments to represent the electorate seriously. The spirit to work together and the democratic values are something not tangible but we cannot go on ignoring the same with impunity. Article 7 must be honoured in practice. The author is Barrister at Law, Senior Advocate, Supreme Court.